Built on a 4-cylinder block, the diesel is offered in 150-, 170- and 195-hp versions. 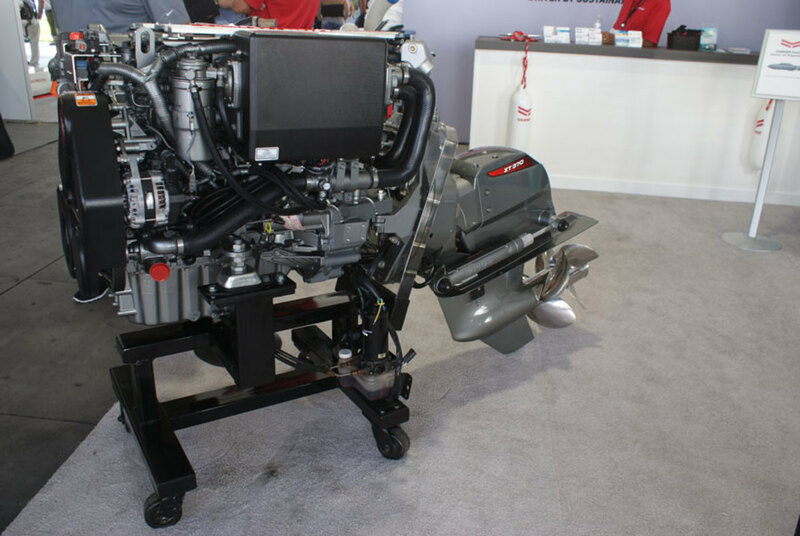 Yanmar introduced a new series of diesel sterndrives at the Fort Lauderdale International Boat Show, built on a 4-cylinder, 2.755-liter (168 cubic inches) block. The common-rail, fuel-injected engine is available in 150-, 170- and 195-hp versions and are paired with Yanmar’s ZT370 twin-prop drive. The turbocharged diesel is raw- and freshwater cooled, and alternator output is 130 amps. Estimated dry weight with the outdrive is 983 pounds. The engine comes with a VC10 control system and electronic CAN-bus control head. Yanmar’s ZT370 outdrive has a hydraulic clutch for shifting and is available in 1.65:1, 1.78:1 and 1.97:1 ratios with twin counter-rotating stainless steel props. For repowers, the drive can use mechanical or electro-magnetic shifting.